I know a few things about the many challenges one faces in cultivating a passion. I started learning Indian classical form Bharatanatyam dance at age four in Kuwait, where I was born. When I was ten, my family moved to India during the Gulf War, and I had to change my dance form to Kathak, which I studied for the next three years. Over the years, I have also taken pottery-painting classes, fabric-painting classes, and speed-typing lessons. When it comes to working with kids, I have taught dance at summer camps and choreographed dance recitals, so I know a little something from the teacher’s perspective as well. Now though, I am a parent and it is my turn to make wise decisions for my son. My son was four the first time I put him in YMCA soccer – twenty-plus kids on the field, one ball, ten minutes of exercise, and free-for-all soccer! Some kids, of course, were naturally gifted and had a blast. It was clear on Day One my son was not going to be one of them. He just stood there. The sun was in his eyes. It was too hot. He was so confused. He just couldn’t understand why so many kids were running behind one ball. Frustrating as it was seeing him so miserable on the field, I spurred him on: “I just want you to get some exercise. Run! Have fun! Move!” The result? My sweet child ran around the field aimlessly, with his eyes closed until he was exhausted! Needless to say, I didn’t put him in soccer camp the next year. But the year after that, he asked about soccer again, so I registered him for the county’s summer camp. They had a great coach who started with general exercises, then taught the children some soccer skills. What an eye-opener! The forty-five minutes he spent in instruction were pure joy to watch. I learned my son appreciates step-by-step education. He then went to a t-ball camp and relished that as well. His swimming teacher also did a great job at navigating his distracted energy by taking a genuine interest in his imaginary world. He recently started Tae Kwon Do at a local studio – which offers another opportunity for him to work more closely with an instructor – and he has developed a real love for this martial art. If someone has a real passion, they eventually find a way – or dare I say it – the talent eventually finds a way to them! As parents though, a big part of the responsibility falls on us to help nudge our children in the right direction. The beauty of talent in any form is that it cannot be contained! Leave children alone and bored long enough, and they will eventually start to do the one thing in which they are truly interested. A parent’s simple job is to make sure you are looking when that happens and pick up on the subtle cues. Also, it is important to notice what works in teaching your child a skill. The right teacher makes all the difference. With many competing resources out there, sometimes it is easy to lose sight of the relationship the teacher nurtures with your child. As a parent, you can judge instinctively if a teacher or coach is the right fit. The perfect mentor recognizes your child’s strengths and elevates his talent. The wrong kind of mentor can do more damage than good. Often times, I have seen parents enroll their children in classes in which they themselves are interested. While that might seem like it’s wonderful for exposure, it is important to prioritize the child’s interest in the activity. Remember, shorter camps and clinics are great for gauging interest. Even the most well-meaning parents do not encourage their children enough. It has to go beyond putting them in the classes. Be a cheerleader! Take pictures, compliment them, share their enthusiasm. To develop a talent, children need the right tools – art supplies, a soccer ball, drums, a space to practice, etc. If affordable classes are not available, consider looking to your computer. Today, everything can be learned through online videos. Find a way to help your child get the right resources to learn and grow. Having taught dance, I would like to encourage parents to have kids practice at home. If your child is struggling with a particular aspect of training, then learn the right way from the teacher and help the child work on improvement at home. Most parents know it is hard to get kids motivated to go to classes even if they love the activity. The thing to note is whether they enjoy it while they are in the class. Love it or hate it, the kids will still make excuses. They will feel lazy. They will rebel. They even get bored. They are children. From personal experience, I know it is tedious to take the children to class and then sit through them. If your child truly enjoys an activity, don’t give up, and don’t let your child give up. There is nothing worse than regret at letting go of an opportunity to follow your passions. Above all, remember, they are children. Allow your kids the space to grow organically within the right structure. Do not expect perfection. Finesse takes time. Just because they do not do well once, does not mean they are not learning. Pushing them relentlessly only threatens to remove any passion they have. Let them fully appreciate what they truly love doing! 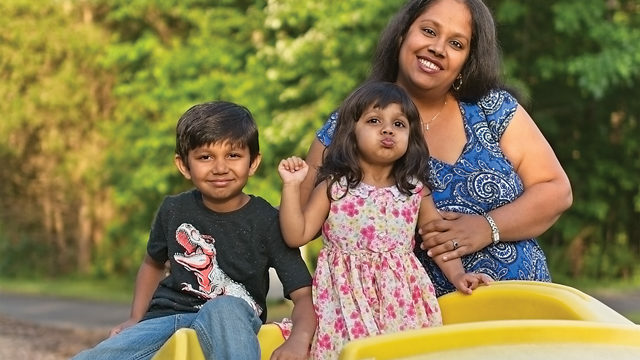 Aditi Wardhan Singh is a Richmond resident and stay-at-home mom of two children ages six and two. She writes about the many challenges we face as parents in our daily lives. She is also a regular contributor to the Huffington Post and Thrive Global. She founded an online magazine to empower parents to find the perfect balance of modern thinking, self, and culture. You can read it at at Raising World Children.